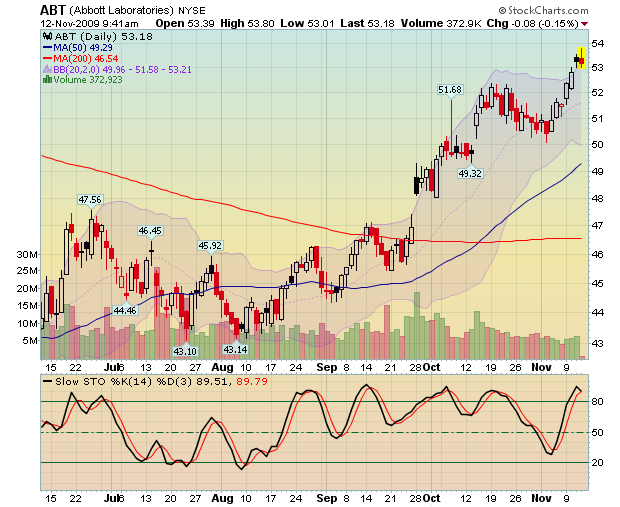 Abbott (ABT) Continues Expansion/Acquisitions – Biologics are HOT! Biologics include a wide range of medicinal products such as vaccines, blood and blood components, allergenics,somatic cells, gene therapy, tissues, and recombinant therapeutic proteins created by biological processes (as opposed to chemically). Biologics can be composed of sugars, proteins, or nucleic acids or complex combinations of these substances, or may be living entities such as cells and tissues. Biologics are isolated from a variety of natural sources – human, animal, or microorganism – and may be produced by biotechnology methods and other technologies. Gene-based and cellular biologics, for example, often are at the forefront of biomedical research, and may be used to treat a variety of medical conditions for which no other treatments are available. In some jurisdictions, biologics are regulated in a different manner than are drugs and medical devics. Abbott (ABT) announced today a definitive agreement to acquire the global rights to PanGenetics BV‘s PG110 fully humanized antibody to Nerve Growth Factor (NGF), expanding the company‘s pain care portfolio and leveraging its expertise in biologics. PG110 is a novel biologic in Phase I clinical trial development that targets NGF for the treatment of chronic pain. NGF is released at sites of tissue damage and inflammation, and plays a significant role in the transmission of pain signals by the central nervous system. Pain is the number one reason people go to see a doctor. There are an estimated 72 million diagnosed chronic pain patients in the U.S. and EU, and up to 30 percent of chronic pain patients get inadequate relief. Current treatments consist of NSAIDs, selective Cox-2 inhibitors, opioids and other analgesics that are dosed daily and have various tolerability and safety issues, including the potential for abuse and addiction. PG110 is currently being studied in a Phase I clinical trial in patients with osteoarthritis. If the Phase I trial is successful, Abbott anticipates evaluating the compound in a number of other pain states, including chronic lower back pain, cancer pain and diabetic neuropathic pain. This new NGF inhibitor complements Abbott‘s robust early-stage pipeline of candidates in development for chronic pain, which spans multiple mechanisms, including vanilloid cellular receptors (TRPV1), cannabinoid receptors (CB2), Histamine H3 receptors and preclinical work on a number of promising ion channel targets. The agreement includes an upfront payment of $170 million plus additional milestone payments, for a total of up to $190 million. This transaction is subject to customary closing conditions and regulatory approvals and is expected to close in the fourth quarter of 2009. Abbott would expect to incur one-time specified items upon the closing of the acquisition, primarily related to in-process research and development. This transaction does not impact Abbott‘s previously issued ongoing earnings-per-share guidance for 2009.